Rendering of the Dream Chaser landing on a conventional runway. Lockheed Martin Space Systems is joining the Sierra Nevada Dream Chaser team and will be its exclusive partner on the NASA Certification Products Contract. Dream Chaser, one of three competitors in the space agency’s Commercial Crew Integrated Capability Program, is Sierra Nevada’s orbital crew vehicle in development and is a piloted aircraft that can land on a runway. The other two are Boeing’s CST-100 and Space X’s Dragon – both capsule designs. The partnership comes at a time when the corporation realizes it needs more experience in building the composite structure, President Mark Sirangelo said in making the announcement. Lockheed Martin has extensive experience in building composite structures for both spacecraft and high performance aircraft. “(This) offers the Dream Chaser team the opportunity for a more robust technical interchange with NASA as we work to develop a safe, reliable orbital crew transportation system. Lockheed Martin currently is developing NASA’s Orion crew vehicle and brings extensive and current experience in obtaining space agency certification for a crewed flight vehicle to the Dream Chaser program, he explained. “We are pleased to join the SNC Dream Chaser team,” Lockheed Martin Vice President Jim Crocker said. “Lockheed Martin brings with it tremendous human-rated space flight knowledge from our significant experience with large, human-flight structures, including 135 flights with the Space Shuttle’s external fuel tanks. “We feel we can share many synergies between the Orion exploration spacecraft and the Dream Chaser lifting body space vehicle. 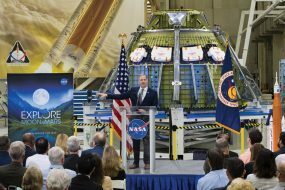 This provides a great opportunity to take NASA’s investments in crew exploration capabilities and leverage them toward commercial transportation to low Earth orbit,” he added.